Balsams developer Les Otten testifies Tuesday before the Senate Commerce Committee. CONCORD – The Balsams redevelopment plan got a boost Tuesday when the Senate Commerce Committee voted unanimously to pass a bill that developers say is key to moving forward. 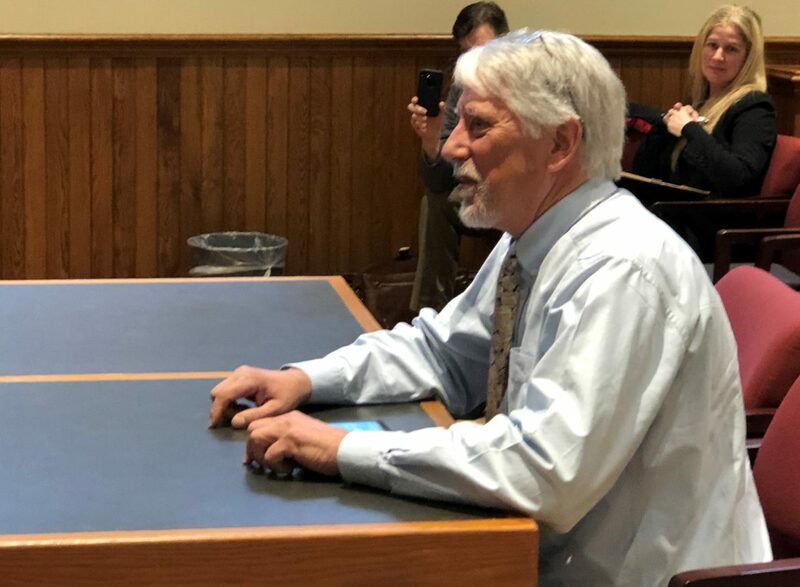 After a 45-minute hearing in which supporters of the Dixville Notch project outnumbered opponents, the committee voted 5-0 to support House Bill 540. The bipartisan vote out of committee follows overwhelming support in the House. On March 20, the House voted 287-60 to support the bill, following a unanimous endorsement from the House Municipal and County Government Committee. Les Otten, longtime ski area developer and former part-owner of the Boston Red Sox, said he was extremely pleased by the vote, which came on opening day of the Red Sox season at Boston’s Fenway Park. Otten, who was instrumental in the restoration of Fenway, told the committee he is hopeful that a similar restoration can occur at one of the state’s northernmost and iconic historic resort hotels. The Balsams closed in 2011. “That’s good news for the North Country,” Otten said after the Senate Commerce Committee vote. For the past five years, Otten has been working on a $173 million plan to redevelop the Balsams into the largest ski resort in New England. He said he is now guardedly optimistic that with the passage, the bill can help him secure the funding to re-open the resort for skiing as early as the 2020-21 ski season. It would mean 600 construction jobs, about 400 full-time jobs and finally, state rooms and meals taxes that could exceed $2.5 million in the first year, Otten said. The bill does not seek financial help from the state. Rep. Edith Tucker, D-Randolph, sponsor of the measure, said she was told the Commerce Committee agreed to put the bill on its Consent Calendar. Unless a senator asks to remove it so he/she can try to get a majority to defeat it, the bill goes on to a list of pending bills for which all senators present vote yes. Then it would go to the governor for his signature. Tucker described HB 540 solely as enabling legislation that would allow Coos County, if it chooses, to create a tax increment finance district in unincorporated places. Such a district would allow investors to participate in its redevelopment through a $28 million bond. Unlike cities and towns that can create their own “TIFs,” the law does not allow that to happen in unincorporated places. Tucker said this would not impact the taxpayers or the county’s bond rating in any way. “I sponsored this bill because this is really important to Coos County,” Tucker said. Suzanne Collins, treasurer of Coos County, spoke to the importance of the bill not only to the Balsams, but to the 23 unincorporated places and the potential for future developments there. As a longtime resident of Colebrook, Collins said she has seen the impact of the resort’s closing, which she described as an outmigration because of the loss of jobs with empty houses and struggling businesses. “You can see how a fabric of a once strong community can quickly unravel when it loses a major employer,” Collins said. Scott Colby, president of the Upper Connecticut Valley Hospital in Colebrook, said there is a correlation between public health and employment and he said his region could use a bit of economic development to help people’s health. But not all North Country residents attending the hearing were there to support the bill. Bob Baker of Columbia urged the senators to oppose the bill. Baker said he is concerned that this could create a tax exemption by allowing the TIF bond to be repaid by improvements within the district, and that county residents would have to wait more than 20 years to start to see that money going to the county coffers. “Why would a private developer…be tax exempt?” Baker asked. The questions are not being answered, he said. “How much of a burden will this be on the taxpayer? These questions aren’t being answered in the zeal to get this project moving,” Baker said. Baker said he worried that there might be an impact on the county bond rating and creditworthiness. Rick Samson of West Stewartstown, and one of three Coos County Commissioners, said he has concerns as well. Samson questioned the level of risk, likely interest rate on the bond, and whether it provides additional tax revenue. Tucker said part of the process of preparing to issue a bond would involve a public hearing and an opportunity for many questions to be answered before a vote.